Middle Eastern cuisine is the cuisine of the various countries and peoples of the Middle East. The cuisine of the region is diverse while having a degree of homogeneity. It includes Arab, Iranian/Persian, Assyrian, Kurdish, Cypriot, and Turkish cuisines. In 2017, Middle Eastern cuisine was claimed by many sources to be one of the most popular and fastest growing ethnic cuisines in the US. Some commonly used ingredients include olives and olive oil, pitas, honey, sesame seeds, dates, sumac, chickpeas, mint, rice, and parsley. Some popular dishes include kebabs, dolma, falafel, baklava, yogurt, doner kebab, shawarma and Mulukhiyah. The Middle East includes the region formerly known as the Fertile Crescent (the land between the Tigris and Euphrates rivers - Sumeria, Akkad, Assyria and Babylonia), where wheat was first cultivated, followed by barley, pistachios, figs, pomegranates, dates and other regional staples. Fermentation was also discovered here to leaven bread and make beer in Mesopotamia, and the earliest written recipes come from that region also. As a crossroads between Europe, Asia, the Caucasus and North Africa, this area has long been a hub of food and recipe exchange. During the first Persian Empire (ca. 550–330 BCE), the foundation was laid for modern Middle Eastern food when rice, poultry and various fruits were incorporated into the local diets. Figs, dates and nuts were brought by merchants to conquered lands, and spices were brought back from the Orient. The area was also influenced by dumplings from Mongol invaders; turmeric, cumin, garlic and other spices from India; cloves, peppercorns and allspice from the Spice Islands; okra from Africa; and tomatoes from the New World, via the Moors of Spain. Religion has also influenced the cuisine; neither Jews nor Muslims eat pork, making lamb the primary meat. Since the Qur'an forbids alcohol consumption, wine and other drinks are made in countries such as Lebanon, where vineyards like Chateau Ksara, Chateau Kefraya and Chateau Masaya have gained international fame for their wines. Prior to its Islamic regime, Iran was also noted for its winemaking. Chateau Ksara is also very popular for its arak, an alcoholic drink produced in the Levant. Al-Maza is Lebanon's primary brewery, which was also, at one time, the Middle East's only beer-producing factory. Lebanon has always been well known in the region for its wines and arak, making it an exception when it comes to lack of alcohol in the region. Under the Ottoman Empire, sweet pastries of paper thin phyllo dough and dense coffee were brought to the area. Grains constitute the basis of the Middle Eastern diet, both historically and today. Wheat and rice are the major and preferred sources of staple foods. Barley is also widely used in the region and maize has become common in some areas as well. Bread is a universal staple—eaten in one form or another by all classes and groups—practically at every meal. Aside from bread, wheat is also used in the forms of bulghur and couscous. Burghul is cracked wheat, made by partially cooking the wheat grains in water, drying it in an oven or in the sun, then breaking it into pieces, in different grades of size. Typically, it is cooked in water, with flavorings, much like rice. Burghul is also used in making meat pies and as an ingredient in salads, notably in tabbouleh, with chopped parsley, tomato, lemon, and oil. Freekeh is another common grain, made from immature green wheat. There are many types of rice produced and consumed in the region. Plain rice is served under grilled meats or with meat/vegetable stews. In more complex rice dishes, there are layers of meat, vegetables, sauces, nuts, or dried fruits. Butter and clarified butter (also known as smen) are, traditionally, the preferred medium of cooking. Olive oil is prevalent in the Mediterranean coastal areas. Christians use it during Lent, when meat and dairy products are excluded, and Jews use it in place of animal fats such as butter to avoid mixing meat and dairy products. Most regions in the Middle East use spices. Typically, a stew will include a small amount of cinnamon, nutmeg, cloves, cumin, and coriander. Black pepper is common, and chili peppers are used occasionally, especially as a separate sauce or as a pickle. Parsley and mint are commonly used both in cooking and in salads. Thyme and thyme blends (za'atar) are common in Syria, Lebanon, Jordan and Israel, and a mixture of dried thyme and sumac (crushed sour berries) is a common breakfast item with oil and bread. Sumac is also sprinkled over grilled meat. Garlic is common to many dishes and salads. Lamb and mutton have always been the favored meats of the Middle East. Pork is prohibited in both Islam and Judaism, and as such is rarely eaten in the region. Prominent among the meat preparations are grilled meats, or kebabs. There are a wide variety of these grills, with many regional specialties and styles. The most common are the cubed cuts on skewers, known as shish kebab in most places. Chicken may also be grilled in the same fashion. Another common variety is kofta kebab, made from ground meat, sometimes mixed with onions and spices, shaped around the skewer like a long sausage and grilled. Kebabs are typically a street or restaurant food, served with bread, salad, and pickles. It is not usually prepared in domestic kitchens. Meat and vegetable stews, served with rice, bulgur, or bread, are another form of meat preparation in the region. Kibbeh is a pie or dumpling made with meat and cereal. The most common are made with ground meat (typically lamb) and burghul, worked together like a dough, then stuffed with minced meat that has been fried with onion, aromatics, and, sometimes, pine nuts or almonds and raisins. This can either be in the form of individual small dumplings (usually shaped like a torpedo), or in slices like a cake, baked on an oven tray with the stuffing placed between two layers of the dough. One variation is kibbeh naye, raw kibbeh, which is made by pounding raw meat and burghul together with seasoning and served with dips of lemon juice and chili sauce. Tursu are the pickled vegetables of the cuisines of many Balkan and Middle East countries. Vegetables and pulses are the predominant staple of the great majority of the people in the Middle East. They are boiled, stewed, grilled, stuffed, and cooked with meat and with rice. Among the green leaf vegetables, many varieties of cabbage, spinach, and chard are widely used. Root and bulb vegetables, such as onions and garlic, as well as carrots, turnips, and beets are equally common. Squash, tomato, eggplants, and okra are distinctive elements in the cookery of the region. (Use your own discretion with this commentary, as Squash and tomatoes originate from the Americas, and are not 'distinctive' to the region as the above suggested.) Eggplant is often fried in slices and dressed in yogurt and garlic, or roasted over an open fire, then pulped and dressed with tahini (sesame paste), lemon juice, garlic, and cumin, a dish known as baba ghanoush. Tomato is the most ubiquitous ingredient in Middle Eastern cookery. It is used fresh in a variety of salads, cooked in almost every stew and broth, and grilled with kebab. Beans and pulses are crucial to the diet of the region, second only to cereals. Fava beans are eaten both green and dried. Dried, they are boiled into one of the most popular Egyptian foods: ful medames, a domestic and street food, eaten for breakfast or any other meal, mashed and dressed in oil, lemon, and chili. Similar dishes are found in all other parts of the region. The famous Falafel, now popular in Europe and America, was originally made from dried fava, crushed and formed into a rissole with herbs and spices, then fried. It is also made from chickpeas or a mixture of the two. Green fava are cooked like other green beans, boiled and dressed in oil, or stewed with meat. The haricot beans and black-eyed beans are also common. Lentils, split peas, and chickpeas are widely used in soups, with rice, in salads, or with meat. Hummus, made from chickpeas and sesame paste, originated in Syria and Lebanon. Meze is a selection of small dishes served to accompany alcoholic drinks as a course or as appetizers before the main dish in Arab countries, Turkic countries, and Iran. Stuffed vegetables are a dish most associated with the Middle East in the popular mind. They are commonly called dolma, the Turkish word meaning "stuffed," but also the Arabic mahshi. Grape leaves, chard, and cabbage are stuffed with rice, ground meat, pine nuts, and spices, and then stewed in oil and tomato. Many vegetables are similarly stuffed and stewed or baked, such as squash, onion, tomato, eggplant, peppers, and even carrots. Mezze is common throughout the Middle East. It consists of a number of small dishes that are picked at leisure: cheese, melon, nuts, various salads and dips, such as tabbouleh, hummus and mutabbal, pickles, and also more substantial items, such as grilled meat, kibbeh, and sausage. Middle Easterners commonly consume milk, fresh or soured. Yogurt, a Turkish contribution, is commonly consumed plain, used in cooking, used in salad dressing, or diluted as a drink. White cheeses, like the Greek feta and halloumi, are the most common in the region. 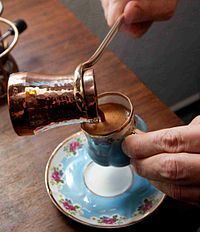 Turkish coffee is the most well known beverage of the region. It is thicker than regular coffee and is made by boiling finely ground coffee in water and then letting the grounds settle. In the 1980s, instant coffee also became popular. Aside from coffee, there is also an alcoholic drink called arak. It is most famous for its potency and milky-white color when water is added, producing the drink nicknamed "the milk of lions". Water and ice are almost always added because of an alcohol content between 30% and 60%. Arak is colorless in its pure form and is aniseed-flavored. In the Middle East, arak is served in social settings and with mezze. Some Christians in the Middle East, such as the Assyrians and Armenians produce their own home made beer and wine. A common drink among Muslims served during Ramadan is Qamar El Deen, a thick and sweet apricot drink. The apricots are boiled with sugar and water until they are thick and placed on wooden planks left in the sun until dry. A fruit leather is left, which is then melted with water and sugar and drunk. Another popular drink is Jallab. It is made by diluting a mixture grape molasses, dates, and rose water and served with crushed ice. Some also serve it with raisins or pine nuts. Ayran (and Doogh) is a beverage made from yogurt very popular in certain Middle Eastern countries such as Turkey and Iran. In some Arab countries of the Middle East, especially in the Arab states of the Persian Gulf, it is common for people to take their food from a communal plate in the center of the table. Rather than employing forks or spoons, people traditionally dine without utensils; they scoop up food with their thumb and two fingers or pita bread. In the Arab culture, the left hand is considered unclean. This however is changing now with utensils being widely used for dining. Even left-handed people eat only with the right hand. A common exception is that the left hand may be used to hold a drinking glass when eating greasy food with the right. It is proper etiquette to compliment the host on the food and their hospitality. Similarly, it is important to try every plate on the table. If a guest does not leave food on his plate, the host generally fills it immediately. The Middle East places emphasis on enjoying meals with family and friends. In Iran, the term "daste shoma dard nakone" [literally 'may your hand not hurt'] is used to thank someone. Similarly, in Iranian Azerbaijan the term "eliz ağırmasın" is used, with the same meaning. Typically, dishes are served according to savoury or sweet, rather than in courses. Food is served in various platters and dishes at a dining table, served in plates, and eaten with cutlery, as is the European tradition. In traditional Iranian restaurants, a large, low table lined with Persian rugs and with cushions around the sides is the setting for feasting; people sit cross-legged in a circle, and food is served in the centre, again eaten with cutlery in separate plates. Afterwards, tea will be served in "kamar baareek" glasses [literally 'narrow waist'] with sugar lumps, Persian sweets, and possibly a ghalyoun, enjoyed in the same communal fashion. When entertaining dinner guests at home, it is seen as discourteous to one's guests to serve the sufficient amount of food for all guests, lest one appears miserly. For this reason, food is always prepared lavishly and in large quantities. An important Persian concept that applies to food and also extends to other areas of daily life is the practice of "taarof"; this is an exercise of self-restraint, whereby if one is offered any food or drink, they will initially politely decline, regardless of how hungry or thirsty they might be. Once the host has insisted and offered repeatedly, they will help themselves. No food and drink is to be accepted upon the first time of being offered it, lest one appears greedy. Tea is usually served in little curved glasses that you hold not by the stem, but by the lip: you never add milk, but you can add water as you drink it to dilute the tea, which is sometimes still steeping when you get it. Coffee is generally available. The coffee is drunk carefully (there are grounds on the bottom); it is also thick and black, and each cup is individually brewed, often with the sugar already in it, and milk is usually not to be added. Since it is offered all the time and everywhere, it is a gesture of hospitality and you must always take the coffee or tea, even if you only put it to your lips or just take a few sips. Your cup will always be refilled if it is less than half full. Because you must never pour your own drink, you must always be alert throughout the meal as to whether your neighbor's cup or glass needs refilling. If it is less than half full, it needs refilling; alternately, if yours is less than half full, your neighbor is obliged to refill it. If he or she does not, do not refill it yourself, for this will cause him or her to lose face; instead, diplomatically indicate your need by pouring a little more drink into your neighbor's glass, even if it doesn't really need it. If you are the honored guest, you will be expected to make a toast, usually soon after the host does or at the end of the meal, just before everyone departs. Dining is done with forks and spoons and knives, Western style. The knife is held in the right hand, and the fork in the left. Do not switch hands for knives and forks. Smoking is ubiquitous in Turkey. People smoke between courses during dinner. The honored guest is served first, then the oldest man, then the rest of the men, then children, and finally women. Do not begin to eat or drink until the oldest man at the table has been served and has begun. You may want to ask your host when it is appropriate to begin. At the end of the meal, it is appropriate to thank the host or hostess for a wonderful meal. In restaurants, you often order each dish as you want it, so that they are not ordered all at once at the beginning of the meal. In informal restaurants, you may be required to share a table. If so, do not force conversation: act as if you are seated at a private table. Waitstaff may be summoned by making eye contact; waving or calling their names is very impolite. Dining etiquette for business meals. Most business meals are lunches. Business meals are generally not good times to discuss business or make business decisions; they are intended to build the more important personal relationship. Take your cue from your Turkish associates: if they bring up business, then it's okay to discuss it, but wait to take your lead from their conversation. Water, and other drinks, may not be served until after the meal is over, as some believe that drinking while eating is not healthy. When you are at a colleague's home for a formal meal, you will be invited to sit anywhere you like at the table; resist the impulse to sit down, and wait until your host gives you further instructions. These will generally come after the host or oldest man is seated, and often you will be placed at his side. It is a great honor to be invited into a Turkish home. Once inside, you may need to remove your shoes (this is not the custom in restaurants, however). If you move from room to room in a Turkish home, be sure to always allow the more senior members of your party to enter the room ahead of you. It is customary to say "Afiyet olsun" ("May what you eat bring well-being") before or after eating, and to say "Elinize sağlik" (it is a compliment to the hostess, meaning "Bless your hand") after the meal. During the month of Ramadan, food consumption increases dramatically throughout Muslim communities. Breaking the fast becomes a banquet, with exchanges of invitations between kin and friends, and public banquets held by charities and associations. Cafes and pastry shops are open at night, and a carnival atmosphere prevails in the streets. Many Muslims, following the reported example of Muhammad, break their fast with a date, followed by a variety of dishes. Sweet pastries and puddings are always present on Ramadan nights everywhere. The end of Ramadan is marked by a festival, Id 'al-Fitr, a feast that breaks the fast, during which a great quantity and variety of sweets and pastries are consumed. The other major Muslim feast is that of 'Id al-Adha, the feast of the sacrifice, which occurs during the pilgrimage month. At this time an animal, usually a sheep or a goat, is slaughtered in every household that can afford it, and great banquets are prepared, with an obligation to give food to the poor. In North America, Middle Eastern food first came became popular in the 1990s with the so-called Mediterranean diet. According to the Mayo Clinic, the benefits included reduced risks of heart disease, Alzheimer's disease and cancer. ^ a b c d "The Middle East: Background & History". Archived from the original on 26 May 2017. Retrieved 20 November 2014. ^ "How Middle Eastern Cuisine Became The 'It' Food Of 2017". The RushOrder Blog. 2017-12-05. Retrieved 2017-12-14. ^ a b "Crisis in the Middle East: layout your solution to bring peace to the region". eNotes. Retrieved 20 November 2014. ^ "In pictures: Turkey's Assyrian wine-makers". BBC News. ^ "Devour Blog: Qamar El Deen". Retrieved 20 November 2014. ^ Mayssam Samaha. "Jallab – A Refreshingly Sweet Summer Drink – Honest Cooking". Honest Cooking. Archived from the original on 1 May 2013. Retrieved 20 November 2014. ^ "Cross Cultural Dining Etiquette". Retrieved 20 November 2014. This page was last edited on 15 April 2019, at 17:43 (UTC).